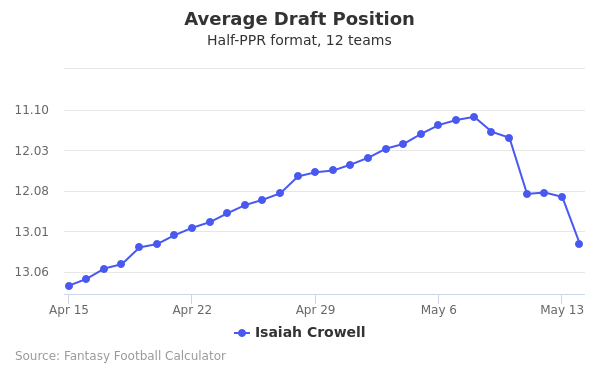 Isaiah Crowell's fantasy value is measured by his average draft position (ADP) in fantasy football mock drafts. 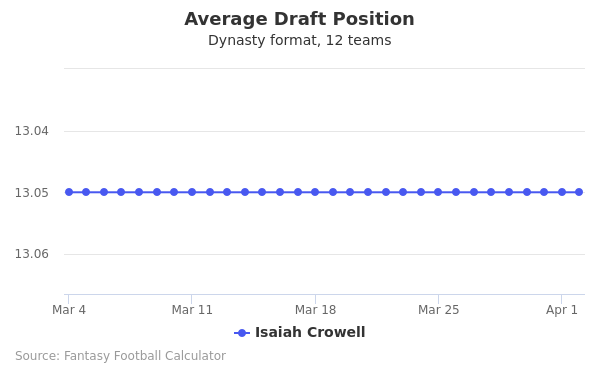 In recent drafts, Crowell's current ADP is 11.08, which indicates that his fantasy outlook is to be the 8th pick of the 11th round, and 128th selection overall. 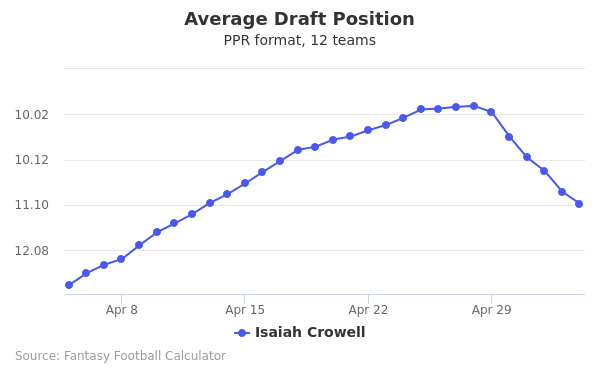 The code below will display a graph that updates every day to show the ADP data for Isaiah Crowell for the past 30 days in 12-team PPR leagues. Draft Isaiah Crowell or Rex Burkhead? Draft Isaiah Crowell or Mike Davis? Draft Isaiah Crowell or Minnesota Defense? Draft Isaiah Crowell or John Brown? Draft Isaiah Crowell or Nyheim Hines? Draft Dak Prescott or Isaiah Crowell? Draft Curtis Samuel or Isaiah Crowell? Draft Isaiah Crowell or Kaimi Fairbairn? Draft Isaiah Crowell or Kenny Stills? Draft Isaiah Crowell or Mitch Trubisky? Draft Dede Westbrook or Isaiah Crowell? Draft Cleveland Defense or Isaiah Crowell? Draft Isaiah Crowell or Ito Smith? Draft Isaiah Crowell or Robert Foster? Draft Isaiah Crowell or Tyrell Williams? Draft Isaiah Crowell or Kyler Murray? Draft David Montgomery or Isaiah Crowell? Draft Isaiah Crowell or Justin Tucker? Draft Harrison Butker or Isaiah Crowell? Draft Isaiah Crowell or Jimmy Graham? Draft Isaiah Crowell or Zay Jones? Draft Donte Moncrief or Isaiah Crowell? Draft Dallas Defense or Isaiah Crowell? Draft Isaiah Crowell or Kyle Rudolph? Draft Denver Defense or Isaiah Crowell? Start Isaiah Crowell or Rex Burkhead? Start Isaiah Crowell or Mike Davis? Start Isaiah Crowell or Minnesota Defense? 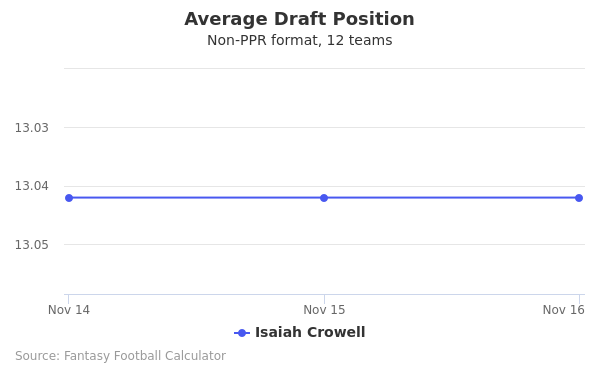 Start Isaiah Crowell or John Brown? Start Isaiah Crowell or Nyheim Hines? Start Dak Prescott or Isaiah Crowell? Start Curtis Samuel or Isaiah Crowell? Start Isaiah Crowell or Kaimi Fairbairn? Start Isaiah Crowell or Kenny Stills? Start Isaiah Crowell or Mitch Trubisky? Start Dede Westbrook or Isaiah Crowell? Start Cleveland Defense or Isaiah Crowell? Start Isaiah Crowell or Ito Smith? Start Isaiah Crowell or Robert Foster? Start Isaiah Crowell or Tyrell Williams? Start Isaiah Crowell or Kyler Murray? Start David Montgomery or Isaiah Crowell? Start Isaiah Crowell or Justin Tucker? Start Harrison Butker or Isaiah Crowell? Start Isaiah Crowell or Jimmy Graham? Start Isaiah Crowell or Zay Jones? Start Donte Moncrief or Isaiah Crowell? Start Dallas Defense or Isaiah Crowell? Start Isaiah Crowell or Kyle Rudolph? Start Denver Defense or Isaiah Crowell? Isaiah Crowell was born on January 8, 1993 in Columbus, Georgia. He played football and ran track at George Washington Carver High School. With a career total of four thousand eight hundred seventy two yards rushed and sixty one touchdowns on four hundred twenty nine carries, it is no wonder he was ranked as number one running back recruit by Scout.com. He began playing for the Universit yof Georgia in 2011. The September 10 game got him promoted to a starting role because he scored two touchdowns. He ended the season with one hundred eighty five carries for eight hundred fifty yards rushed, five touchdowns, and eight receptions for fifty nine yards. Other highlights include being named freshman of the year and playing in the Outback Bowl. Due to an arrest on a weapons charge, he was kicked out of the University of Georgia. He then transferred to Alabama State for the 2012 season. After the 2013 season finished, he declared his intent to enter the NFL Draft for 2014. Crowell participated in the NFL combine with a thirty eight inch vertical jump. Other strengths include a hard and fast running speed that is effective in attacking. His weaknesses were going down too easy and his immaturity that could make him difficult to coach. He got a career high sixty two receiving yards, most of the yardage from a fifty three yard catch, against the San Diego Chargers. Crowell finished with a total of seven hundred six yards on one hundred eighty five carries and five touchdowns. He ranked third overall in rushing yards. Against the Baltimore Ravens, he scored the first touchdown reception of his career. He also became the first one hundred yard rusher of the season for the Browns. He finished the year with a total of seven hundred six yards on one hundred eighty five carries and four touchdowns. Crowell made a career high eighty five yard touchdown against the Baltimore Ravens. It was the second longest rushing run in team history. He ran a total of nine hundred fifty two yards, seven touchdowns, and forty receptions for the season. Crowell was in the middle of controversy in July 2016 when he posted a photo of a person slitting the throat of a cop. He apologized later. Follow him on Twitter.